Additive manufacturing is an automatic process used to create rapid prototypes and functional end-use parts. It takes virtual designs from Computer Aided Design (CAD) software, and transforms them into thin, virtual, horizontal layer-wise cross-sections, until the model is complete. The AM is a potentially growing market in every manufacturing sector with a global additive manufacturing market of $1,843.2 million in 2012 and is expected to grow at a CAGR of 13.5% to reach $3,471.9 million by 2017. The global devices market has been segmented into different areas such as, automotives, consumer products, business machines, medical, academic, aerospace, government/military and others. Automotives or motor vehicles account for the largest share in this market, primarily due to the easy applications of 3D printing in the production of end-products (engines, spare parts, other interior, and exterior parts) as compared to other segments such as consumer products and business machines, which have limited usage in manufacturing of end-products. Rising healthcare expenditure in emerging economies provide growth opportunities for the AM technologies, as new healthcare facilities have come up in these areas. New and improved technologies, financial support from governments, large application area, rapid product development at a low cost, and ease of development of custom products are the major drivers that are slated to propel additive manufacturing market. However, a few pivotal factors restraining the growth of this market are regulatory hurdles in different countries, material characterization during development, and process control and understanding. In this report, we are mainly focusing on medical applications of AM. Within the medical industry, additive manufacturing is used in making end-products such as surgical equipments, prosthetics & implants, and scaffolds. The additive manufacturing market is growing due to the rising incidence of surgeries, coupled with increasing awareness and advances in technology. Surgical equipments account for the largest share in this market due to their wide applicability. Europe dominates the AM for medical devices market in 2012, followed by North America. However, adoption of novel technologies in the medical field is gaining momentum at a fast pace in emerging nations due to growing educational and awareness efforts of industry players among physicians and patients. Moreover, increasing healthcare expenditure, growing income levels, low cost of manufacturing, rapid product development, growing surgical procedures in lieu with medical tourism, and lesser competition than mature countries, have amplified interest of market players in emerging markets. 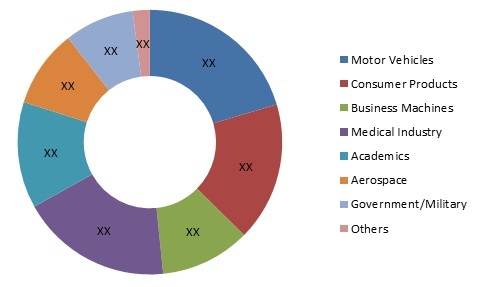 The key players in this market are 3D Systems Corporation (U.S.), 3T RPD (U.K.), Arcam AB (Sweden), Biomedical Modeling, Inc. (U.S.), Envisiontec GmbH (Germany), EOS GmbH Electro Optical Systems (Germany), Fcubic AB (Sweden), GPI Prototype and Manufacturing Services, Inc. (U.S.), Greatbatch, Inc. (U.S.), Layerwise NV (Belgium), Limacorporate SPA (Italy), Materialise NV (Belgium), Medical Modeling, Inc. (U.S.), and others. Additive manufacturing for medical devices market is studied by dividing the overall market on the basis of industry, materials, products, technology and application. Traditionally additive manufacturing in the medical field was considered as a technique for the production of prototypes or model. However, with the development of more biocompatible materials and advanced technologies, the market has started showing a preference for additive manufacturing of 3D products. The biggest advantage of additive manufacturing technologies over traditional manufacturing technologies is that they allow rapid production of parts at low costs. It is possible to achieve better accuracy and complexity in products through additive manufacturing as compared to traditional manufacturing methods. The market is also showing preference towards new applications of additive manufacturing such as in tissue engineering and organ printing for the continuum of advantages offered by them over traditional techniques. The principal advantages of these procedures over traditional manufacturing is short product development time, better patient recovery, development of patient or surgeon specific products, low manufacturing costs, and better accuracy. Technological innovations in 3d printing have been witnessed over the past few years. Newer surgical products manufactured from AM, with better safety and efficacy attributes, contribute to the widespread adoption of the additive manufacturing in medical by physicians and patients worldwide. The penetration rate of additive manufacturing for the medical devices market is faltering in emerging markets. However, established companies and new entrants in the additive manufacturing for medical devices market should consider these GDP growth rates, ease of product approval, increasing procedural volumes, and low penetration rates compared to mature markets, as the driving opportunistic factors that will plant the seed for future possible success for such companies. Europe accounts for the largest market share of the global additive manufacturing for medical devices market in 2012, followed by North America. In the future, it is estimated that the share of the European region will decrease, attributable to lowering device prices, regulatory pressures, and increasing focus of players towards emerging markets in the Asian and Latin American regions. 12.8 GPI PROTOTYPE& MANUFACTURING SERVICES, INC.